This week's literary news from Egypt, Bangladesh, the ALTA conference and on the recent Nobel Prize list. 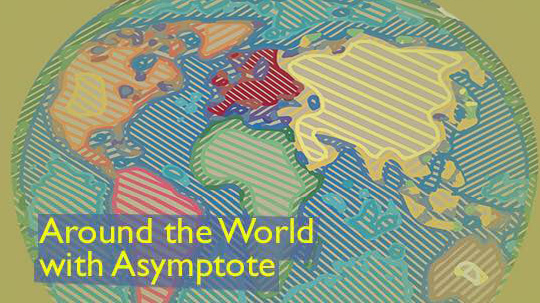 Welcome to this edition of Asymptote’s weekly update, a hop, step, and jump tour de force bringing you the latest from three continents of literature in translation. To kick off, our Egyptian Editor-at-Large Omar El Adi sends us his bulletin, including news on literary prizes and an upcoming event in London. We then zoom in on Bangladesh, where Editor-at-Large for India Naheed Patel reports on recent festivals and the passing of Bangla authors. Also, US-based Assistant Editor Julia Leverone visited the ALTA conference so you didn’t have to. And finally Assistant Managing Editor Janani Ganesan gives us the round-up from the literary world on the Nobel Prize in Literature being awarded to Bob Dylan. The inaugural annual lecture of the Saif Ghobash Banipal Prize for Arabic Literary Translation will be given by Palestinian author Anton Shammas at the British Library in London on 14 October. The jury for this year’s prize includes last year’s winning translator Paul Starkey, professor of Arabic Zahia Smail Salhi, writer and journalist Lucy Popescu, and literary consultant and publisher Bill Swainson. Paul Starkey’s 2015 win came for his translation of Youssef Rakha’s The Book of the Sultan’s Seal: Strange Incidents from History in the City of Mars (2014). An excerpt of Rakha’s third book Paulo (forthcoming in English) was featured in the Spring 2016 issue of Asymptote. The winner of the prize will be announced this December. In Alexandria, Tara Al-Bahr, an interactive online platform, is launching its second print edition with original essays as well as translations into Arabic on the topics of cultural and artistic practices and urban change in contemporary Alexandria. Tara Al-Bahr launched in May this year, and its second printed edition came out on Thursday, 6 October. The Facebook group Alexandria Scholars is commencing a series of talks, titled “The City Dialogue Series”, with the support of the Swedish Institute in Alexandria, and curated by the sociologist Amro Ali. The first lecture, “Alexandria and the search for meaning”, was on 10 October and explored solutions to the city’s problems “through the terrain of historical, urban, and philosophical analysis”. Future events involving writers, academics, political figures, and researchers have already been planned for November and December. In publishing news, Mohamed Rabie’s Otared (2016) was released in English translation in September by AUC Press. The novel was shortlisted for the International Prize in Arabic Fiction in 2016 and is set in a dystopian post-revolutionary Egypt. An excerpt is available here. Halal If You Hear Me, a forthcoming anthology of writings by Muslims who are queer, women, gender nonconforming or transgender, is calling for submissions. Editors Fatimah Asghar and Safia Elhillo are looking for submissions of up to five poems or two essays, including a cover letter with contact info and a short bio. Those interested should email halalifyouhearme@gmail.com before 1 December, 2016. Next month sees Bangladesh’s capital revving up for the annual Dhaka Literary Festival, which runs from November 17-19. The festival has been held at the historic Bangla Academy since 2012, and is directed and produced by Sadaf Saaz, Ahsan Akbar, and K. Anis Ahmed. In the face of numerous recent Freedom of Expression violations in Bangladesh, the festival marks a resurgence of Bangladeshi literary culture, reaching across a number of different disciplines and genres: from fiction and literary non-fiction to history, politics and society; from poetry and translations to science, mathematics, philosophy and religion. The festival has more than 20,000 attendees and past contributors include Vikram Seth, Tariq Ali, Rosie Boycott, William Dalrymple, Ahdaf Soueif, Shashi Tharoor, Jung Chang, and Pankaj Mishra as well famous writers of Bangla literature like Hasan Azizul Huq, Selina Hossain, Debesh Roy, and Nirmalendu Goon. In August and September Bangladesh mourned the passing of two prominent Bangla poets. Author, poet, and playwright Syed Shamsul Haq died at the age of 81 in Dhaka on September 27, 2016, and renowned Bangladeshi poet Shaheed Quaderi passed away in New York at the age of 74 on August 28, 2016. Haq was given the Bangla Academy Award in 1966 and the Ekushey Padak, the highest national award of Bangladesh, in 1984. He was also honored with a Swadhinata Padak in 2000 for his contribution to Bangla Literature. Payer Awaj Paoa Jay’ [We Hear the Footsteps] and Nuruldiner Sara Jibon [The Entire Life of Nuruldin], his most popular plays, are considered to be cornerstones of Bangladeshi theatre. Shaheed Quaderi received the Ekushey Padak in the category of Language and Literature in 2011 and was previously awarded the Bangla Academy Award in 1973. Prominent Bengali scholars such as Kabir Chowdhury, Kaiser Haq, and Farida Majid have translated his poems into English.